IMPORTANT: Before you view this video playlist you will need to scroll to the free game at the bottom of this page, skip the intro and select "sound off" to turn off the music. Firstly, if you would like to play the free online version of Hang-On then you will find the game further down this page. However, it's well worth reading about the history of the game to really appreciate it and obtain a real sense of just how breathtaking it was to play in the mid 1980s. 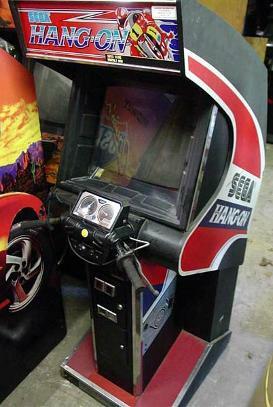 Hang-On was released into the arcades by Sega in 1985. It may look pretty underwhelming these days, but back in the day this was one of the first arcade games to use 16-bit graphics and pseudo 3D sprite-scaling. The revolutionary game was a real thrill to play and incredibly fast due to the "super-scaler" technology which gave high frame rates. To add to the realism it also featured motion control allowing the player to control his/her motorbike by leaning left and right which was very novel at the time. Hang-On became the first major hit for Sega and the arcade system board was also used for Space Harrier and Enduro Racer. There was also a stand-up version of the game released which was controlled using a handle bar and brake levers, which was so much more fun than using a joystick. I believe another upright machine with a seat was also launched. 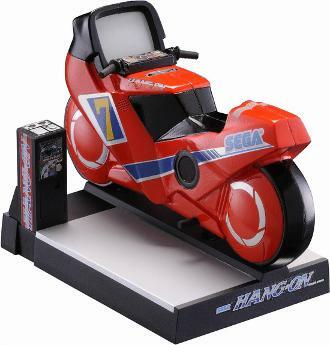 Stand-up version of Hang-On by Sega. Creative Commons photo fromStrategyWiki enhanced by SimplyEighties.com. An excellent version of the game was also released for the Sega Master System and was built-in to the consoles for a limited time. What I like about many of the 3D arcade games from the early to mid 1980s is the fact they were uncomplicated. Just about anyone could insert a coin and play from the offset. As the title suggests, the concept of Hang-On is pretty simple and you simply need to ride as fast as you can against other bikers and reach each checkpoint before the timer runs out. An enhanced, second version of the game was released into the arcades in 1987 by Sega entitledSuper Hang-On - you can see a clip in the video playlist at the top of the page. The "super-scaler" technology was later used in other popular hit games including Space Harrier,Out-Run and After Burner. FREE GAME INSTRUCTIONS: To play this free version of Hang-On (below) simply select start with your mouse and use your arrow keys to control your bike and try to reach each checkpoint before the timer runs out. Please note that the game will not run on mobile phones and android tablets.